The rise of former President Gloria Macapacal-Arroyo, now Pampanga 2nd district representative, to the speakership of the House of Representatives has the backing of Bohol’s three congressmen. First District Rep. Rene Relampagos yesterday confirmed that the three of them- -himself, 2ndDistrict Rep. Erico Aristotle Aumentado, and 3rdDistrict Rep. Arthur Yap- -voted for the take over of Arroyo. He said that the three of them were one in voting to support the election of Arroyo to be the next Speaker of the House. According to Relampagos, different groups in the House of Representatives called a meeting where they raised the move to make changes at the lower house and the change was to replace the leadership. He, however, said that unfortunately, he was not able to participate in the deliberation of the groups as he was still travelling from Bohol to Manila when the meeting was called at around 8:30 a.m. on Monday. However, he was still able to join the groups when they called to reconvene the House of Representatives, since it was in the evening after the State-of-the-Nation Address (SONA) when the voting for the new Speaker of the House was conducted. Relampagos said that as he understood it, there were groups calling for the ouster of then Speaker Pantaleon Alvarez after seeing the need to change the leadership. This was because they had seen that the executive-legislative agenda would be suffer under the continued leadership of Alvarez. The groups had seen that the leadership of Alvarez “would not be to the best interest of the House and at the same time, it will not be good in so far as pursuing in supporting the legislative priorities of the president, the administration”, according to Relampagos. He also said that there was an impression that President Rodrigo Duterte’s daughter, Davao City Mayor Sara Duterte-Carpio had a hand in it and it was in line with this that it was believed the Palace had a hand in the turn of events. “Segun sa mga istorya nga nakita sa akong kaubaban, ingon sila nga naa. Ug, ang pruweba ani mao ang anak sa atong president was somehow making calls sa leaders sa nagkalain-laing grupo to support his initiative,” according to Relampagos. Relampagos added that definitely, with the election of a new leader in the House, there would follow some changes in the structure at the House of Representatives. He said it is expected to unfold in the coming days, and that as of now, he prefers not to pre-empt it. Relampagos also shared that the consensus to change leadership at the House of Representatives was the character of Alvarez whom he said other described as not so approachable and not so acceptable. He added that there were also stories that led to the impression that Alvarez had been dominating or like a dictator. This prompted some groups or the majority to call for the ouster of Alvarez. Relampagos, just Gov. Edgar Chatto, remains a member of the Liberal Party, while Yap had joined with Arroyo in transferring to PDP-Laban, and Aumentado remains with the National People’s Coalition. 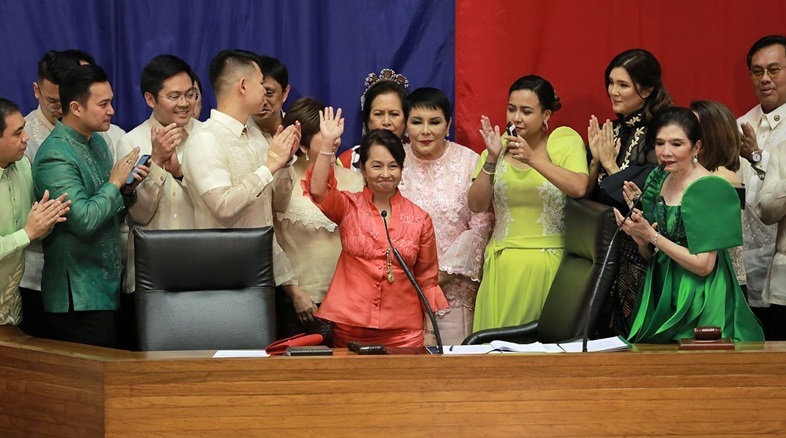 Arroyo took the Speakership of the House from Alvarez Monday night by the votes of 184 members of the House of Representatives, and became the first woman Speaker and the “21st leader of the House”.